Robert Clarke, PhD, DSc is an internationally recognized leader in breast cancer research. Dr. Clarke is the Dean for Research and Professor of Oncology at Georgetown University Medical Center. His research interests include understanding the cellular and molecular mechanisms driving antiestrogen resistance and hormone independence in breast cancer. He also is interested in drug resistance (cytotoxic, endocrine), drug/hormone interactions, and the application of molecular profiling (e.g., transcriptome, proteome, tissue array analyses) to predict breast cancer phenotypes and identify functionally relevant gene signaling networks. As an expert in cancer systems biology, Dr. Clarke leads several multinational molecular medicine studies in breast cancer, in collaboration with colleagues at the Georgetown Lombardi Comprehensive Cancer Center, Virginia Tech, and the University of Edinburgh, Scotland. 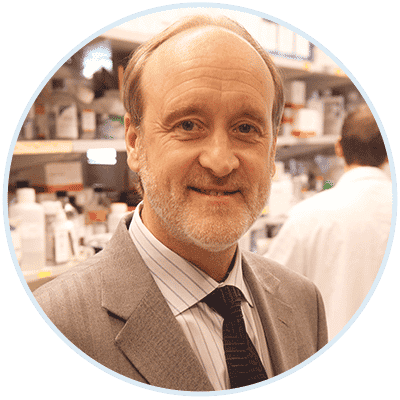 He has served as chair of peer-review study sections for NIH and the Department of Defense, and currently serves on the editorial boards of over a dozen international peer review journals. Dr. Clarke is a Fellow of the Royal Society of Chemistry, a Fellow of the Royal Society of Medicine, and a Fellow of the Royal Society of Biology in the U.K.